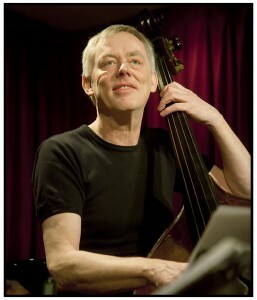 Bassist, born 1948 in Copenhagen. An itinerant example of Danish Jazz in world class. One of the absolute ‘aces of bass’ with a history of more than 600 recordings behind him. Professional at age 16, house-bass player at the legendary, original Jazzclub Montmartre in Copenhagen, and the holder of an impressive list of engagements with Jazz Masters. We mention at random: Herbie Hancock, Wayne Shorter, Stan Getz, Gary Burton, Hank Jones, Tony Williams, Dexter Gordon, Ben Webster, Joanne Brackeen, Sonny Stitt, Sir Roland Hanna, Benny Goodman, Dizzy Gillespie, Dollar Brand, Clark Terry, Chet Baker, Art Farmer, Woody Shaw, Benny Bailey, Dusko Goykovich, Ed Thigpen, Alvin Queen, Billy Hart, Bruno Castelucci, John Engels, Daniel Humair, Sangoma Everett, Enrico Pieranunzi, Roger Kellaway, Tete Montoliu, Horace Parlan, Fred Hersch, Martial Solal, Renée Rosnes, Gordon Beck, Dee Dee Bridgewater, Meredith d’Ambrosio, Deborah Brown, Mark Murphy, Etta Cameron, Toots Thielemans, Lee Konitz, Johnny Griffin, Sahib Shihab, Stuff Smith, Don Byas, Charlie Mariano, Ernie Wilkins, Philip Catherine, Bob Brookmeyer, Monty Alexander, Eddie “Lockjaw” Davis, Peter Herbolzheimer, Janne Schaffer, Quincy Jones, Svend Asmussen, Istanbul Express, Thomas Clausen, Alex Riel, Kim Sjøgren, Finn Savery, The Danish Radio Big Band, etc., etc. Mads Vinding has performed all over the world, produced several records, written film scores and is the recipient of several distinguished Jazz awards: in 1978 was awarded first prize as best soloist in the International Radio contest NORDRING. Got The Ben Webster Prize in 1982 and Palæ Jazz Prize in 1997. Awarded Launy Grøndahl’s honorary prize 2000. Winner of Jazz Special’s Readers Poll 1997 + 2000. Received Three Grammy’s for Best Album 2000 in the Jazz and Folk category and another one for best Folk album 2003. Received the Django d’or award as “Master of Jazz” in 2007 and the Danish Musician’s Union Honorary award in 2008. Peter H. Larsen, Editor, Danish Radio, P2 Jazz.